A huge VT support poster was hung in the Squires Student Center. This poster was filled with fingerprints and moving messages. 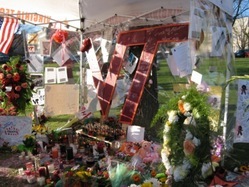 People volunteered to set up a stone marked with "VT" for other people to light candles. I took a picture of these flowers on the drillfield near the memorial. As a form of relief to help with the pain of this tragedy this file was created to remember those who were lost. 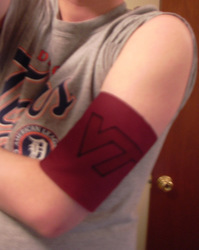 What started as a simple VT leaning by a tree became a major focal point of reflection. President Bush signed this VT and a shelter was placed around the VT and other memorabilia. Taken Saturday 21 April. VT flowers on the drillfield near the Burruss memorial. Photo taken Friday, April 20.